Marc Chagall was a Russian-French artist who excelled in many mediums such as painting, book illustrations, stained glass, stage sets, ceramics, tapestries, and fine art graphic works. Marc Chagall saw his work as "not the dream of one people but of all humanity". Chagall has produced stained glass windows for cathedrals of Reims and Metz, windows for the United Nations, as well as the Jerusalem Windows in Israel. Chagall synthesized the art forms of Cubism, Symbolism, and Fauvism (which led to the rise of Surrealism) but it is his use of color that makes Chagall's work so special. Pablo Picasso had said in the 1950's, "When Matisse dies, Chagall will be the only painter left who understands what colour really is." This piece is an original lithograph by Marc Chagall, done in 1967. It was created as a part of a series of illustrations for the book "In the Land of the Gods", which consists of 12 original lithographs and was printed in 120 copies. This piece is hand signed and numbered from the edition of 25 artist proofs on Velin d'Arches. The sheet measures 25.6 x 20 inches and the framed dimensions are 33 x 27.5 inches. 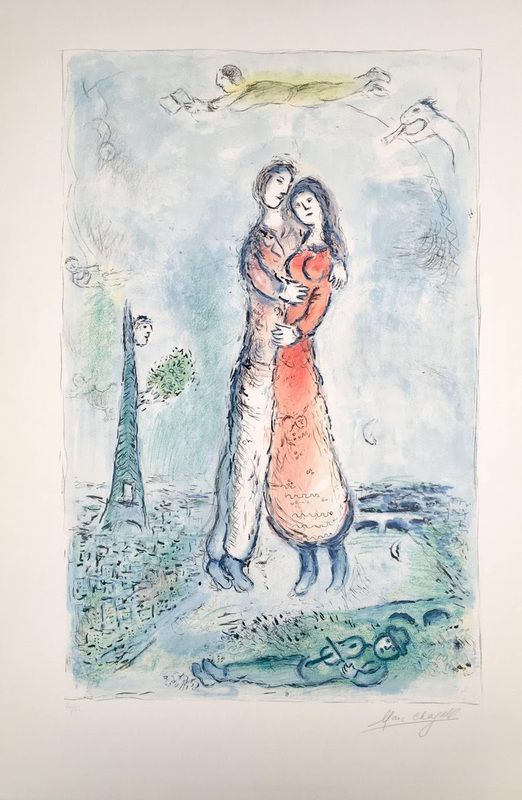 This piece is referenced as number 536 in "Chagall Lithographe, Vol. III" by Fernand Mourlot and Charles Sorlier. Click here to view this piece on our website. This piece is an original color etching and aquatint by Marc Chagall. It is from the series of 26 pieces entitled "Celui Qui Dit les Choses sans Rien Dire", which was created in 1975-76. This piece is hand signed and numbered 9/25 from the edition of 25 on Japon Imperial aside the edition of 25 on Rives wove paper. There is also 180 copies numbered 26 to 205, and 20 hors commerce copies. The dimensions of the image are 15.5 x 11.6 inches on 19 x 14.5 inch paper. This piece is unframed. The piece is referenced as number 99 in "Marc Chagall: The Illustrated Books" by Patrick Cramer. This piece is an original lithograph by Marc Chagall, created in 1967. It was published in "La revue du XXe siecle" and is hand signed and numbered from the edition of 75 on Velin d'Arches paper. The dimensions of this image are 13 x 10 inches on 21.7 x 14.2 inch paper. This piece is unframed. 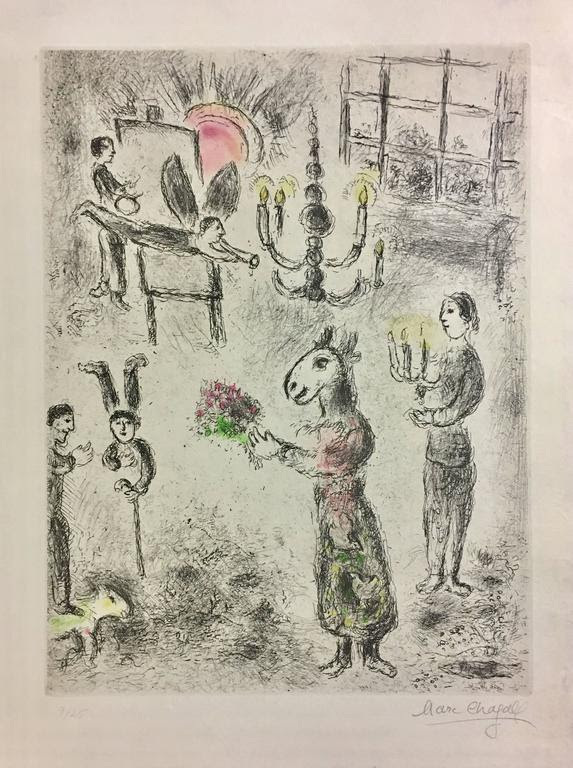 This piece is referenced as number 488 in "Chagall Lithographie, Vol. III" by Fernand Mourlot. This piece is an original color lithograph by Marc Chagall, done in 1980. It was created as one of fourteen lithographs from the collection "The Fourteen Large Lithographs of 1980", which was a series inspired by his editor's, Aime Maeght, request to realize a few large scale lithographs. Chagall became so absorbed in the project that he went above and beyond Maeght's request and completed 14 plates in the largest sheet size that could possibly fit on the presses. When they were completed, Aime Maeght presented them in an exhibited and took Chagall, who was very ill at the time, to see them on his walls. 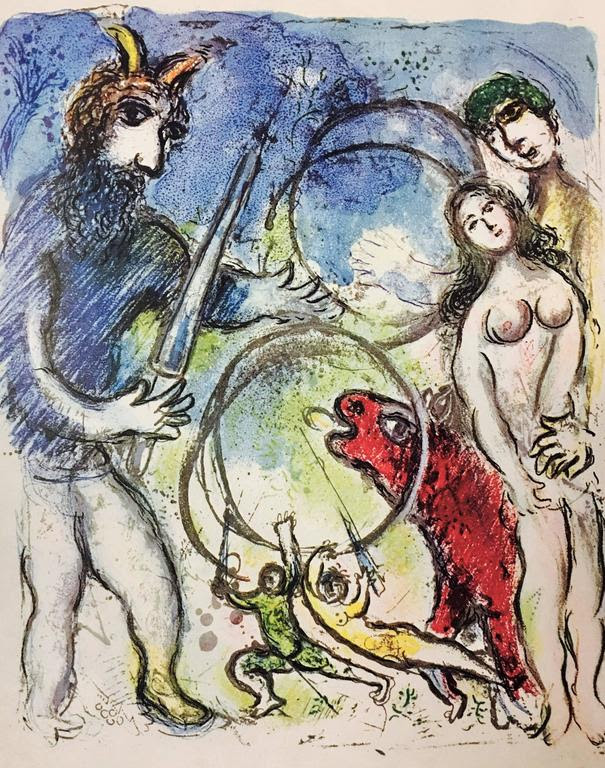 The lithographs in this collection were the last works edited by Marc Chagall. This piece is hand signed and numbered from the edition of 50 on Arches wove paper. The image measures 38 x 24 inches and the sheet measures 47 x 31 inches. 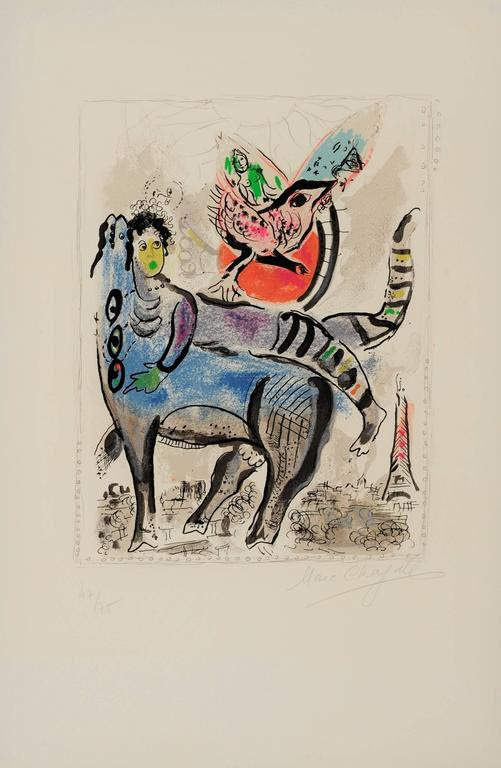 This piece is referenced as number 976 in "Chagall Lithographie, Vol. VI" by Mourlot and Charles Sorlier.